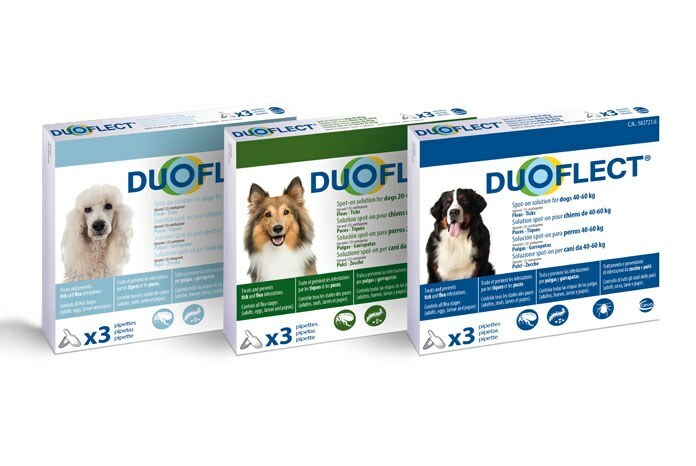 Containing a new strength formulation of the tried and trusted active ingredients, fipronil and (s)-methoprene, DUOFLECT’s duration of action against fleas is 100% longer in cats (eight weeks) and 13% longer in dogs (nine weeks) than the market-leading fipronil combination, while its duration of action against ticks is 150% longer in cats (five weeks) and 50% longer in dogs (six weeks)1,2. It acts against both adult fleas on the animal and immature flea stages in the environment and it can also be used as part of a treatment strategy for the control of flea allergy dermatitis (FAD). Spot-on solution. Clear yellow solution. Treatment and prevention of flea and/or tick infestations. The product can be used as part of a treatment strategy for the control of Flea Allergy Dermatitis (FAD). In dogs: - Treatment and prevention of flea infestations (Ctenocephalides spp). Immediate insecticidal efficacy against new infestations with adult fleas persists for 9 weeks. 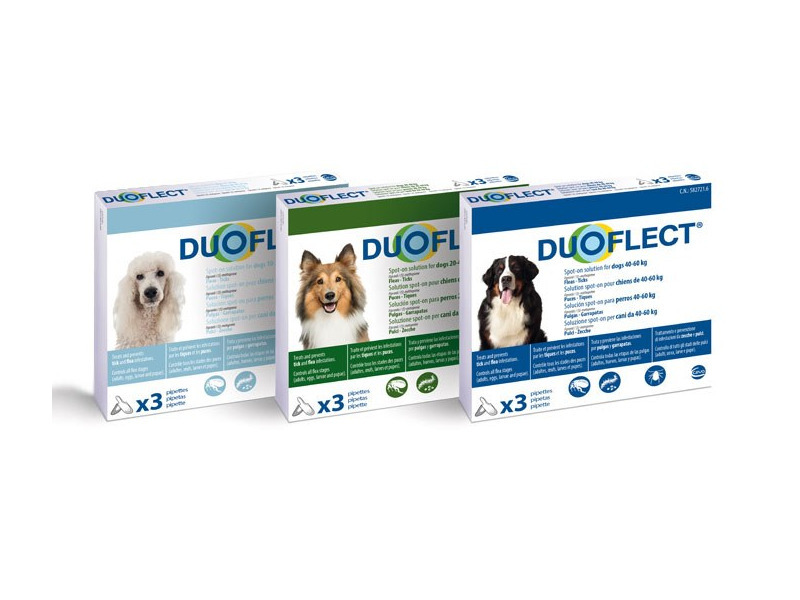 Prevention of the multiplication of fleas by inhibiting the hatching of flea eggs (ovicidal activity) and the development of flea eggs into adult fleas for 8 weeks after application. - Treatment and prevention of tick infestation (Dermacentor reticulatus, Rhipicephalus sanguineus). The product has immediate and persistent acaricidal efficacy for 6 weeks after application . In cats: - Treatment and prevention of flea infestations (Ctenocephalides spp). Immediate insecticidal efficacy against new infestations with adult fleas is seen persisting for 8 weeks. Prevention of the multiplication of fleas by inhibiting the hatching of flea eggs (ovicidal activity) and the development of flea eggs into adult fleas for 6 weeks after application.- Treatment and prevention of tick infestation (Rhipicephalus turanicus). The product has immediate and persistent acaricidal efficacy for 5 weeks after application. Do not use in rabbits as adverse reactions, even mortality, could occur. Do not use in case of hypersensitivity to the active substance or to any of the excipients. The attachment of single ticks after treatment cannot be ruled out. Therefore the transmission of infectious disease cannot be completely excluded if conditions are unfavourable. All stages of fleas can infest the animal’s basket, bedding, and regular resting areas such as carpets and soft furnishings. In cases of massive flea infestation and at the beginning of the control measures these areas should be treated with a suitable environmental product. To reduce environmental flea challenge, all animals living in the same household should also be treated with a suitable flea control product. For the treatment and control of flea allergy dermatitis it is recommended that allergic patients and all other animals in the household should be treated on a regular basis. The effect of bathing dogs on the duration of product efficacy against fleas has been studied. Weekly water immersion of dogs following treatment had no effect on the duration of efficacy. Shampooing of dogs with an emollient shampoo 48 hours prior to treatment had no effect on duration of efficacy. Weekly shampooing with an emollient shampoo in dogs may reduce the duration of efficacy to 3 weeks against adult fleas and to 6 weeks against immature stages of fleas. Weekly bathing with a chlorhexidene shampoo may reduce effectiveness against adult fleas to 3 weeks. No data on the effect of bathing/shampooing on the efficacy of the product in cats is available. For external use only. Do not administer orally. Avoid contact with the eyes of the animal. If the product is in contact with eyes, rinse immediately with plenty of water. Do not apply the product on wounds or skin lesions. Wait for the application site to dry before allowing the treated animal to come into contact with valuable fabrics or furnishings. It is important to make sure that the veterinary medicinal product is applied directly onto an area of dry skin where the animal cannot lick it off and to make sure that animals do not lick each other following treatment. In the absence of additional safety studies, do not repeat the treatment at intervals of less than 2 weeks. The safety of the product has not been established in dogs younger than 8 weeks of age weighing less than 2 kg bodyweight (bw). The safety of the product has not been established in cats younger than 8 weeks of age or weighing less than 1 kg of bw. This product can cause eye irritation. Avoid contact of the product with skin, eyes or mouth.People with known hypersensitivity to any of the ingredients should not treat their animal with this product. Treated animals should not be handled or played with for at least 12-hours after treatment. Animals should be treated in the evening in order to minimise contact with the treated animal. On the day of treatment, treated animals should not be permitted to sleep with their owner, especially children. Do not eat, drink or smoke while handling the product. Wash hands thoroughly after use. In case of accidental spillage on skin, wash off immediately with soap and water. If the product accidentally gets into the eyes, they should be thoroughly flushed with water. If the product is accidentally swallowed, seek medical advice immediately and show the package leaflet to the physician. Keep stored pipettes in the original packaging until ready to use. In order to prevent children from getting access to used pipettes, dispose of used pipettes immediately in a proper way. Treated dogs should not be allowed to swim in watercourses for 48 hours after application of the product. Transient cosmetic effects, such as spiking of the hair, wet appearance, dry residue or slight scaling, may occur at the application site. These changes do not affect the safety or the efficacy of the product. If animals lick the product, transient hypersalivation, mainly due to the excipients of the product, may be noticed. After swallowing the product some dogs may also vomit. Studies carried out with fipronil in laboratory animals have not shown teratogenic or fetotoxic effects, although neurotoxicity has been shown in rats. However, as no studies have been conducted on cats and dogs during pregnancy and lactation with this product, its use during pregnancy and lactation is recommended only after the benefit/risk assessment by the responsible veterinarian. One pipette per animal corresponding to the minimal recommended dose of 12 mg/kg bw of fipronil and 6 mg/kg bw of (S)-methoprene. Disconnect one of the blisters from the card. This helps to avoid accidental opening of the adjacent blister in order to protect the still unopened pipettes from exposure to humidity. Open the blister with scissors. To avoid damaging the pipette cut along the line marked with the scissors icon. Carefully peal back the foil from the cut off end and withdraw the pipette. Hold the pipette upright. Tap lightly to ensure the entire liquid content is within the main body of the pipette. Bend the upper border strip backwards. Then the pipette can be set aside, if necessary. To open the pipette, snap off the top of the pipette along the scored line. Part the coat between the shoulder blades until the skin is visible. Place the tip of the pipette on the skin and squeeze the pipette several times to empty its content completely and directly onto the skin in one spot. Application of the solution near the base of the neck minimises the possibility that the animal will lick the solution off. Care should be taken after the application that animals do not mutually lick off the solution. Care should be taken to avoid excessive wetting of the hair with the product since this will cause a sticky appearance of hairs at the treatment spot. Treatment can be repeated every 6 weeks on dogs and every 5 weeks on cats, or as considered appropriate for the type and level of parasitic exposure. In the absence of appropriate studies, the treatment should not be repeated at intervals of less than 2 weeks. No adverse effects were observed in a target animal safety study conducted in 8 weeks old puppies weighing approximately 2 kg bw treated on 7 consecutive occasions at 2 week intervals with up to 5x the recommended dose. No adverse effects were observed in a target animal safety study conducted in 8 weeks old kittens weighing approximately 1 kg bw treated on 7 consecutive occasions at 2 week intervals with up to 5x the recommended dose. Pharmacotherapeutic group: Ectoparasiticides for topical use, fipronil combinations. ATCvet code: QP53AX65 The product is an insecticidal and acaricidal solution for topical use, containing an association of an adulticidal active ingredient, fipronil, in combination with an ovicidal and larvicidal active ingredient, (S)-methoprene. Fipronil is an insecticide and acaricide belonging to the phenylpyrazole family. It acts by interacting with ligand-gated chloride channels, in particular those gated by the neurotransmitter gamma-aminobutyric acid (GABA), thereby blocking pre- and post-synaptic transfer of chloride ions across cell membranes. This results in uncontrolled activity of the central nervous system and death of arthropods such as fleas and ticks. Fipronil acts by contact. After topical administration, fipronil accumulates itself in sebaceous glands and is released progressively on hair surface via follicular ducts. Fipronil usually kills fleas within 24 hours and ticks within 48 hours. (S)-methoprene is an insect growth regulator (IGR) of the class of compounds known as juvenile hormone analogues that inhibit the development of immature stages of insects. This compound mimics the action of juvenile hormone and causes impaired development and death of the developing stages of fleas. (S)-methoprene acts by contact. The on-animal ovicidal activity of (S)-methoprene results from either inhibition of egg laying by absorption through the cuticle of the adult fleas or from inhibition of egg hatching by direct penetration in newly laid eggs. In the environment of the treated animal, (S)-methoprene is also effective in the elimination of flea larvae and pupae, preventing these stages from developing into adults. This prevents further contamination with newly emerged adult fleas. Fipronil Fipronil is poorly absorbed through the skin. After topical application in clinical conditions (licking not prevented): Fipronil and its major metabolite are well-distributed in the haircoat of dogs and cats after topical administration. In dogs: Peak fipronil plasma concentrations (mean Cmax 25.5 ng/ml) are slowly attained (mean tmax approximately 96 h). Fipronil is metabolized to fipronil sulfone. In cats: Peak fipronil plasma concentrations (mean Cmax 316 ng/ml) are rapidly attained (mean tmax approximately 8 h). Fipronil is slightly metabolized to fipronil sulfone. (S)-methoprene In dogs and cats, plasma concentrations of S-methoprene were generally below the limit of quantification (10 ng/mL) after topical application. Butylhydroxyanisole (E320). Butylhydroxytoluene (E321). Ethanol (anhydrous). Diethylene glycol monoethyl ether. Packs containing 1, 3, 6, 12, 24, 60 or 120 pipettes. Any unused veterinary medicinal product or waste materials derived from such veterinary medicinal products should be disposed of in accordance with local requirements. The product should not enter water courses as this may be dangerous for fish and other aquatic organisms. Treatment and prevention of flea and/or tick infestations. Treatment and prevention of tick infestation (Rhipicephalus turanicus). The product has immediate and persistent acaricidal efficacy for 5 weeks after application. Do not use in rabbits, as adverse reactions, even mortality, could occur. Do not use in case of hypersensitivity to the active substance or to any of the excipients. All stages of fleas can infest the cat’s basket, bedding, and regular resting areas such as carpets and soft furnishings. In cases of massive flea infestation at the beginning of the control measures these areas should be treated with a suitable environmental product. To reduce environmental flea challenge, all animals living in the same household should also be treated with a suitable flea control product. For external use only. Do not administer orally. Avoid contact with the eyes of the animal. If the product is in contact with eyes, rinse immediately with plenty of water. Do not apply the product on wounds or skin lesions. Wait for the application site to dry before allowing the treated cat to come into contact with valuable fabrics or furnishings. It is important to make sure that the veterinary medicinal product is applied directly onto an area of dry skin where the animal cannot lick it off and to make sure that animals do not lick each other following treatment. In the absence of additional safety studies, do not repeat the treatment at intervals of less than 2 weeks. The safety of the product has not been established in cats younger than 8 weeks of age or weighing less than 1 kg of body weight (bw). This product can cause eye irritation. Avoid contact of the product with skin, eyes or mouth. People with known hypersensitivity to any of the ingredients should not treat their animal with this product. Treated animals should not be handled or played with for at least 12-hours after treatment. Animals should be treated in the evening in order to minimise contact with the treated animal. On the day of treatment, treated animals should not be permitted to sleep with their owner, especially children. Do not eat, drink or smoke while handling the product. Wash hands thoroughly after use. In case of accidental spillage on skin, wash off immediately with soap and water. If the product accidentally gets into the eyes, they should be thoroughly flushed with water. If the product is accidentally swallowed, seek medical advice immediately and show the package leaflet to the physician. Keep stored pipettes in the original packaging until ready to use. In order to prevent children from getting access to used pipettes, dispose of used pipettes immediately in a proper way. Transient cosmetic effects such as spiking of the hair, wet appearance, dry residue or slight scaling may occur at the application site. These changes do not affect the safety or the efficacy of the product. If animals lick the product, a transient hypersalivation mainly due to the excipients of the product may be noticed. Studies carried out with fipronil in laboratory animals have not shown teratogenic or fetotoxic effects, although neurotoxicity has been shown in rats. However, as no studies have been conducted on cats and dogs during pregnancy and lactation with this product, its use during pregnancy and lactation is recommended only afterthe benefit/risk assessment by the responsible veterinarian . Disconnect one of the blisters from the card. This helps to avoid accidental opening of the adjacent blisters in order to protect the still unopened pipettes from exposure to humidity. Open the blisters with scissors. To avoid damaging the pipette cut along the line marked with the scissors icon. Carefully peal back the foil from the cut off end and withdraw the pipette. Hold the pipette upright. Tap lightly to ensure the entire liquid content is within the main body of the pipette. Bend the upper border strip backwards. Then the pipette can be set aside, if necessary. To open the pipette snap off the top of the pipette along the scored line. Treatment can be repeated every 5 weeks or as considered appropriate for the type and level of parasitic exposure. In the absence of appropriate studies, the treatment should not be repeated at intervals of less than 2 weeks. No adverse effects were observed in a target animal safety study conducted in 8 weeks old kittens weighing approximately 1 kg bw treated on 7 consecutive occasions at 2 weeks intervals with up to 5x the recommended dose. (S)-methoprene is an insect growth regulator (IGR) of the class of compounds known as juvenile hormone analogues that inhibit the development of immature stages of insects. This compound mimics the action of juvenile hormone and causes impaired development and death of the developing stages of fleas. (S)-methoprene acts by contact. The on-animal ovicidal activity of (S)-methoprene results from either inhibition of egg laying by absorption through the cuticle of the adult fleas or from inhibition of egg hatching by direct penetration in newly laid eggs. In the environment of the treated animal, (S)‑methoprene is also effective in the elimination of flea larvae and pupae, preventing these stages from developing into adults. This prevents further contamination with newly emerged adult fleas. Fipronil Fipronil is poorly absorbed through the skin. After topical application in clinical conditions (licking not prevented), peak fipronil plasma concentrations (mean Cmax 316 ng/ml) are rapidly attained (mean tmax approximately 8 h). Fipronil is slightly metabolized to fipronil sulfone. Fipronil and its major metabolite are well-distributed in the haircoat after topical administration. (S)-methoprene Plasma concentrations of S-methoprene were generally below the limit of quantification (10 ng/mL) after topical application. Pipettes are packed in child resistant blisters. Treatment and prevention of flea infestations (Ctenocephalides spp). Immediate insecticidal efficacy against new infestations with adult fleas persists for 9 weeks. Prevention of the multiplication of fleas by inhibiting the hatching of flea eggs (ovicidal activity) and the development of flea eggs into adult fleas for 8 weeks after application. Treatment and prevention of tick infestation (Dermacentor reticulatus, Rhipicephalus sanguineus). The product has immediate and persistent acaricidal efficacy for 6 weeks after application. The product can be used as part of a treatment strategy for the control of Flea Allergy Dermatitis (FAD) in dogs. The attachment of single ticks after treatment cannot be ruled out. Therefore the transmission of infectious disease cannot be completely excluded if conditions are unfavourable. All stages of fleas can infest the dog’s basket, bedding, and regular resting areas such as carpets and soft furnishings. In cases of massive flea infestation and at the beginning of the control measures these areas should be treated with a suitable environmental product. To reduce environmental flea challenge, all animals living in the same household should also be treated with a suitable flea control product. The effect of bathing dogs on the duration of product efficacy against fleas has been studied. Weekly water immersion of dogs following treatment had no effect on the duration of efficacy. Shampooing of dogs with an emollient shampoo 48 hours prior to treatment had no effect on duration of efficacy. Weekly shampooing with an emollient shampoo in dogs may reduce the duration of efficacy to 3 weeks against adult fleas and to 6 weeks against immature stages of fleas. Weekly bathing with a chlorhexidene shampoo may reduce effectiveness against adult fleas to 3 weeks. For external use only. Do not administer orally. Avoid contact with the eyes of the animal. If the product is in contact with eyes, rinse immediately with plenty of water. Do not apply the product on wounds or skin lesions. Wait for the application site to dry before allowing the treated dog to come into contact with valuable fabrics or furnishings.It is important to make sure that the veterinary medicinal product is applied directly onto an area of dry skin where the animal cannot lick it off and to make sure that animals do not lick each other following treatment. In the absence of additional safety studies, do not repeat the treatment at intervals of less than 2 weeks. The safety of the product has not been established in dogs younger than 8 weeks of age weighing less than 2 kg bodyweight (bw). Transient cosmetic effects such as spiking of the hair, wet appearance, dry residue or slight scaling may occur at the application site. These changes do not affect the safety or the efficacy of the product. If animals lick the product, a transient hypersalivation mainly due to the excipients of the product may be noticed. After swallowing the product some dogs may also vomit. Disconnect one of the blisters from the card. This helps to avoid accidental opening of the adjacent blister in order to protect the still unopened pipettes from exposure to humidity. Open the blisters with scissors. To avoid damaging the pipette cut along the line marked with the scissors icon. Carefully peal back the foil from the cut off end and withdraw the pipette. Treatment can be repeated every 6 weeks or as considered appropriate for the type and level of parasitic exposure. In the absence of appropriate studies, the treatment should not be repeated at intervals of less than 2 weeks. No adverse effects were observed in a target animal safety study conducted in 8 weeks old puppies weighing approximately 2 kg bw treated on 7 consecutive occasions at 2 weeks intervals with up to 5x the recommended dose. Fipronil Fipronil is poorly absorbed through the skin. After topical application in clinical conditions (licking not prevented), peak fipronil plasma concentrations (mean Cmax 25.5 ng/ml) are slowly attained (mean tmax approximately 96 h). Fipronil is metabolized to fipronil sulfone. Fipronil and its major metabolite are well-distributed in the haircoat after topical administration. Transient cosmetic effects, such as spiking of the hair, wet appearance, and dry residue or slight scaling may occur at the application site. These changes do not affect the safety or the efficacy of the product. If animals lick the product, a transient hypersalivation mainly due to the excipients of the product may be noticed. After swallowing the product some dogs may also vomit. Transient cosmetic effects, such as spiking of the hair, wet appearance, dry residue or slight scaling may occur at the application site. These changes do not affect the safety or the efficacy of the product. There are currently no questions for Duoflect - be the first to ask one!